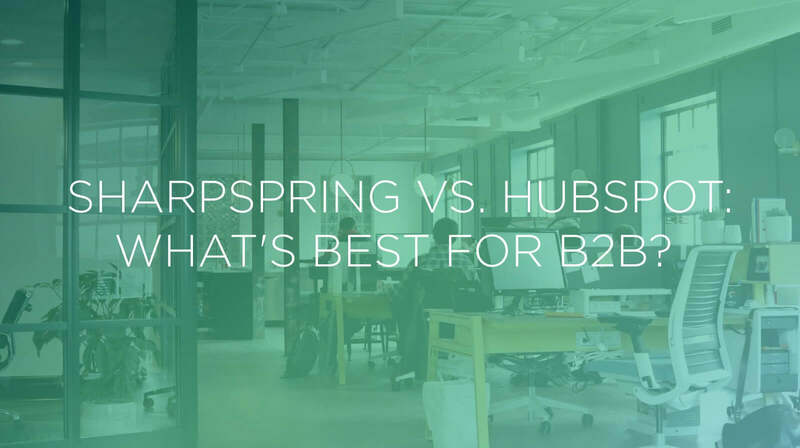 SharpSpring vs. HubSpot: What's Best for B2B? How to choose the right marketing automation software for your business. Marketing automation plays an increasingly important role in the growth of many businesses—especially online. Done well, automation helps businesses spend their marketing budgets more intelligently, so they waste less time spamming people who aren’t interested in their products and services, and more time focused on those who are. However, for automation to work well, businesses must choose the right software to work with. The wrong decision could leave them stuck in a hefty year-long contract, a system that doesn’t integrate well with their other online tools, or software that is frustrating to use. To better help B2Bs make a good decision for their business, we’re going to look at two of the big players in marketing automation: HubSpot, an early innovator and giant in the content marketing field, and SharpSpring, a relatively recent disruptor with a highly competitive system. In the interests of full disclosure, let me say up front that we favor SharpSpring. Not only are we the only gold-certified partner in Michigan, we also use them with many of our own clients. That means we have a lot of experience working with the system, and can give it our full recommendation. However, that’s not to say HubSpot is a bad tool by any means. In fact, their platform overlaps with SharpSpring on many core features. And although we don’t use their system, we do follow their blog for industry insight. Nevertheless, our loyalties remain with SharpSpring, and we think yours should, too. Here’s why. 1. Flexible and affordable pricing structures. Any serious B2B automated marking solution is going to have costs attached. The question is, how much should users pay for those services, and what sort of contract should that entail? Both HubSpot and SharpSpring offer tiered pricing, with HubSpot’s “Professional” tier coming it at $800/mo. and SharpSpring’s tiers ranging from $450–875/mo. (Agency prices may differ, based on your contract and the services they offer.) SharpSpring’s $850/mo. plan also comes with a one-time $1,800 onboarding package. By comparison, HubSpot’s onboarding fee for their equivalent “Professional” package is $3,000. All this means HubSpot is more expensive for most businesses, especially with the onboarding package included. But there’s another hitch: HubSpot requires an annual contract, whereas SharpSpring only bills month-to-month. Given the onboarding costs, it’s unlikely you’ll sign up for either of these plans and decide to quit within a year—especially if you also have a marketing contract with an agency that includes automated marketing management. However, the lack of flexibility in the contract is a concern for some businesses, and we also prefer the option to cancel at the end of a given month of the service doesn’t work out. 2. Keeping content management on your site. Both HubSpot and SharpSpring integrate with other CMSs, but HubSpot makes a stronger push for you to create content on their system. Some of their smart blogging features can only be done using their platform, and for us that is a hard no. We’re a WordPress agency for good reason. It’s the best content management system on the Internet, it offers robust custom development options, and we trust the plugins and security measures we have in place. By forcing users to use the HubSpot CMS for some features, we believe HubSpot is making a misstep down the road toward hosted CMSs, where users lose control of their content and are shoved into a more dependent relationship with their marketing automation software than is necessary to use their services effectively. There’s no reason your marketing automation software should double as your CMS. This makes SharpSpring a vastly preferable alternative. We can hook up every one of their features to our WordPress sites, which means our clients stay in control of all their data. SharpSpring keeps their focus on marketing automation, and we keep ours on content management. Both HubSpot and SharpSpring offer robust tool kits for all kinds of automated marketing tasks, including branching scenarios, triggers, time-based and behavior-based automations, persona development, and segmentations. They also offer excellent tracking and analytics functions. However, HubSpot’s tool kit also contains some features which we find frankly unnecessary. Take their SEO tool for one: it may be a nice-to-have if you aren’t already doing your own SEO work, but if you are, it’s not adding anything of value. It’s just cluttering your tool bar. And the functions it does perform aren’t as robust as, say, Moz. Oddly, one area where HubSpot does fall short is in their social media integration. While they do provide some tools, SharpSpring’s offers more automation behaviors and gives more insight into the life of the lead. In terms of the features they do provide, HubSpot and SharpSpring are toe-to-toe. We simply find SharpSpring’s interface easier to navigate, in part because it doesn’t suffer from feature bloat. 4. Maintaining first point of contact with the agency. Finally, most of our clients, when they hire us, do so because they want us to run and manage their automated marketing campaign. This is, after all, a huge part of the service we provide. It’s our expertise. And while we always include SharpSpring training in our marketing contracts (because we firmly believe you should know how to use the system you’re paying for), we also know that we’ll be the primary users on that system. After all, we’re often responsible for creating and scheduling content, programing automated work flows, linking them to landing pages, and measuring and reporting on metrics. This is where the SharpSpring partner relationships work to our benefit. Instead of wedging their way between the close and collaborative relationship we have with our clients, SharpSpring lets us stay the first point of contact. For our clients, that means that instead of having to interface with two separate entities (us and SharpSpring), they only have to focus on us. It’s simple and efficient, which means better service and lower costs. When it comes to SharpSpring vs. HubSpot, SharpSpring wins. As we said before, SharpSpring and HubSpot share a lot of features. But if you’re already working with a marketing agency (like us), and what that agency to manage your marketing automation without having to deal with a third party yourself, SharpSpring is a better option. And, as we covered, it also has an edge in terms of its flexible pricing and user experience. HubSpot, on the other hand, seems more optimized for businesses that are going it alone and need an “all-in-one” solution. Some of the built-in tools won’t be as efficient as the ones you would find elsewhere. But if you don’t want to learn how to use all those tools (and aren’t willing to hire someone who already knows), then HubSpot may seem like a more attractive option. And while building a landing page on a CMS that isn’t WordPress is a hard no for us, we know that businesses that don’t have a team of skilled web designers and developers backing them may find some value in those functions. But so long as you’re investing your marketing dollars in a team of highly-trained professionals, you want to give them the tools that will let them do their job most effectively. For us, that means SharpSpring.